HABA 3521 - "Mirror, mirror along the track... how many marbles roll around the edge?" The shatterproof acrylic mirror provides thrilling optical effects! Complementary to all HABA building blocks and marble run sets. 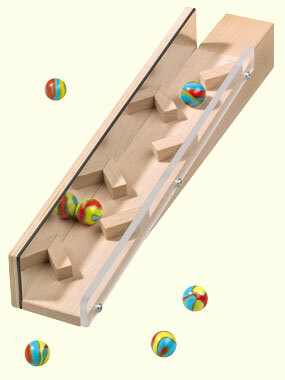 Wooden set includes one mirror track and six marbles. Mirror track measures 12.5" long.